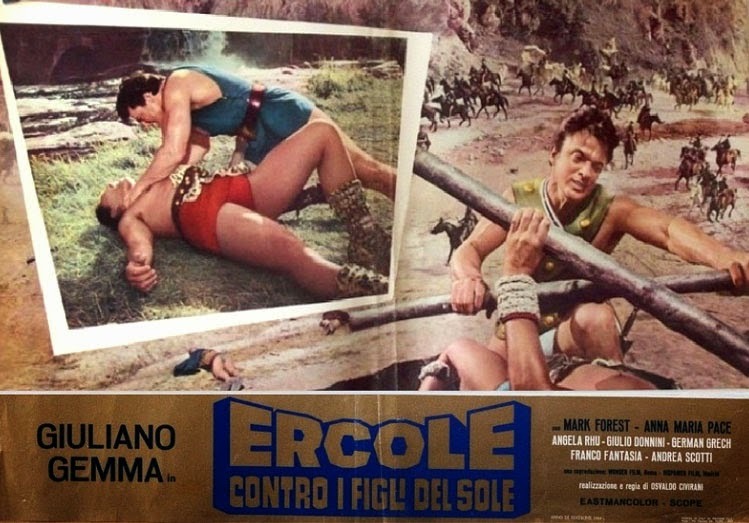 This Italian lobby card for HERCULES AGAINST THE SONS OF THE SUN, a story set in South America with Incas, is filled with mistakes: first the photo on the left is not from the film but from GOLIATH & THE SINS OF BABYLON. Mark Forest is strangling Harold Bradley, who's most definitely not an Inca. Second big mistake is the back ground image which shows horses. There are no horses in film itself but also there were no horses during the time it's set. Horses were re-introduced in the Americas with the arrival of Colombus and Spaniards. Third mistake, Giuliano Gemma is headlining while Mark's name is in small letters. This is not a real error per se but Mark was the lead actor in this film and it's odd that his name is not on top.